1 of 5 Cut off peel and slice sections from 5 of the oranges (for step-by-step instructions, see Kitchen Basics, page 158). Place in a bowl. Juice remaining orange (you will need 1/4 cup juice). 2 of 5 In a small bowl, whisk orange juice, vinegar, mustard, sugar, 1/4 tsp of the salt and 1/8 tsp of the pepper. Microwave cumin in a small bowl for 40 seconds or until fragrant. Whisk into orange juice mixture. While whisking, add oil in a thin stream. 3 of 5 Place chicken in a resealable plastic bag and add 1/3 cup of the dressing. Marinate 15 minutes. 4 of 5 Meanwhile, heat grill or grill pan. Remove chicken from marinade and discard any remaining marinade. Grill for 14 minutes, turning once, or until chicken registers 160 degrees on an instant-read thermometer. 5 of 5 In a very large bowl, toss spinach, lettuce, orange sections (and any juice in bowl), red onion slices, goat cheese and remaining dressing. 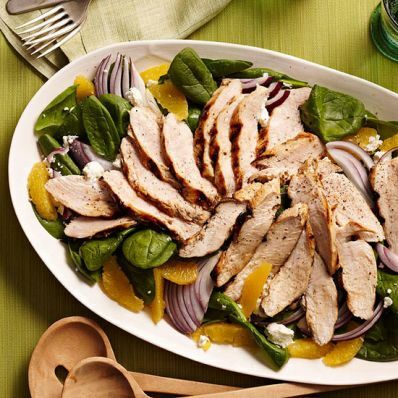 Slice chicken and fan over top of salad. Sprinkle with remaining 1/4 tsp salt and 1/8 tsp pepper and serve.